If you haven’t yet tried Raised Plaster Stencils on small craft projects, you’re missing out! For durability, use pre-mixed tile grout instead of joint compound as the raised medium. It dries rock hard and stays put through abuse! This beautiful box started out as a thrift store find for $3.00. 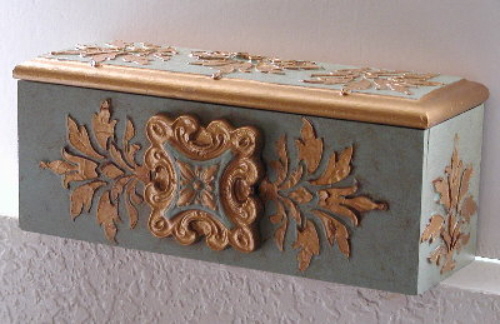 After it was primed, I applied our Raised Plaster Bennington Frieze Stencil and then painted over the design and the box with sage green paint. 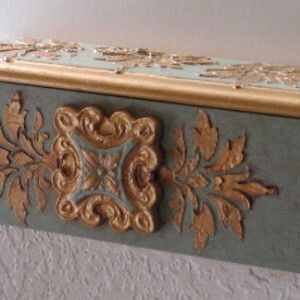 I then painted the raised design and trim with gold metallic paint to make it pop. Adding a cast plaster ornamental piece to the very front (with the same colors) made the entire box just come to life.